(1) The vendor and contracting party for the merchandise presented in the online shop „Stichezauber” is Detlef Zech – Stichezauber, Elsengrund 6, 16248 Lunow-Stolzenhagen, Phone: +49 (0) 333 65 71 956, Fax: +49 (0) 333 65 71 957, E-Mail: info(at)stichezauber.de, (referred to hereinbelow as the “Vendor“ for short). 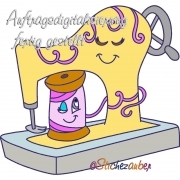 (1) The Vendor is offering the digital content (embroidery files and E-Books) presented in the online shop for sale. The colors of the articles shown on the website may vary slightly depending on the internet browser and monitor settings used by customers; these variations are technically navoidable. (2) The offered articles are sold to the customer solely for personal use and small sole traders use. The customer has no right to use the embroideries and E-Books for commercial purposes in large amounts and/or to reproduce more than 50 items per year per single design. In any case the transfer of title and usufruct shall be required in writing. (3) The selection of merchandise, conclusion of contract and implementation of the agreement shall take place, to the selection of the customer, in German or English. (4) The Vendor shall deliver the merchandise to destinations worldwide. (5) Customers shall select the merchandise desired by placing it in their “Cart” by clicking on the button “Add to Cart“ („In den Warenkorb“). The customer termintes his selction of the merchandise by clicking the button “Checkout” or by using the button “Check out with PayPal”. The order will be conclusively placed with the Vendor by clicking on the button “Order Now” or by the button “Pay Now”. Until the order is transmitted to the Vendor, customers have the opportunity to review, at any time, the data they have input when placing the order, to modify them or to completely discontinue the order. (6) The Vendor is making a binding sales offer for the merchandise presented in its shop. By transmitting the order using the button “Order Now” or by the button “Pay Now”, the customer accepts the sales offer. The Vendor shall confirm the conclusion of the contract by e-mail (contract confirmation). (7) The content of the contract concluded is stored by the Vendor and will be forwarded to the customer with the contract confirmation. In case the customer has set up a personal account with the online shop, the customer can view the content of the contracts concluded also in his account on the Vendor‘s website. (8) The Vendor shall inform the customer by e-mail of any impediments preventing the delivery from being made, or of any other circumstances that might prevent contractual performance. (1) All product prices are end prices in Euro. Prices include turnover tax in the amount of 19% (VAT, Umsatzsteuer). (2) The Vendor does not charge any shipping costs for digital items. The reception of digital content requires that the customer has an email address and an internet connection. The vendor points out that the customer’s e-mail and/or network supplier may charge the customer extra costs for the data reception; the vendor has no means of influencing them. Shipping costs for physical items apply (such as for Embroidery Threats). (3) Where deliveries are made to countries outside the European Union customs or acquisition tax for imported goods may have to be paid by the customer to the customs authorities upon receipt of the shipment. These duties will accrue in addition to the purchase price and the shipping costs; the Vendor has no means of influencing them. (4) The Vendor shall deliver the merchandise – at the selection of the customer – against pre-payment by bank transfer („Cash in advance“), Credit Card or against pre-payment using PayPal. (a) Where the customer has selected “Cash in advance” as the form of payment, the Vendor’s bank account details will be provided within the contrat confirmation e-mail. Exclusively transfers denominated in Euros and free of charge for the Vendor shall be accepted for bank transfers from abroad. (b) Where the customer has selected “PayPal” as the form of payment he will connect to the PayPal online service, from where payment can be made subsequently. (c) Where the customer selected "Credit Card" as the form of payment the customer enters credit card information. The credit card will be charged upon completion of checkout. (1) The customer will receive a download-link to the bought and paid digital content depending on the selected payment methode. The reception of digital content requires that the customer has an email address and an internet connection. (a) Where the customer has selected “PayPal” or "Credit Card" as the form of payment he will be redirected to the respective download page having completed the payment process and can perform the download there. (b) Where the customer from Germany has paid by “Cash in advance” the vendor will send within two business days after payment an e-mail to the customer which concludes all the details and the link to the respective download page. Here he can download the digital content. It is the customer`s obligation to ensure that the he can access the e-mail address input in the course of his purchase. (c) Customers having their permanent residence outside Germany and using the payment “Cash in advance” will receive the E-Mail with the download link by derogation from (b) within a maximum period of four business days after the payment. (2) The Customer can use the download for 30 business days after having it received by the vendor. During this time he can download the digital content for maximum of five times. (4) The pre-requisites and legal consequences of the German stipulations as to consumers’ rights of withdrawal shall apply to consumers having their permanent residence outside the European Union also in those cases in which national law of the consumer does not provide for a right of withdrawal. The right of withdrawal expires immediatly after the customer received the download link to the digital files, which might be less than 14 days after the purchase. (2) To the extent a customer uses the services of PayPal for payment, the data protection provisions established by PayPal shall apply to the payment process. In this context, PayPal shall be taking action as the person employed by the customer in the performance of their obligations (Erfüllungsgehilfe), not as a person so employed by the vendor. (3) The laws of the Federal Republic of Germany shall apply, to the exclusion of the United Nations Convention on the International Sale of Goods (UNCISG). However, German law shall not apply to transactions with consumers having their permanent residence abroad to the extent the national laws applicable to those consumers set out provisions that cannot be contracted out to the detriment of the consumers. (4) Should individual provisions of the present General Terms and Conditions prove to be invalid or impossible to implement, this shall not affect the validity of the remaining provisions.